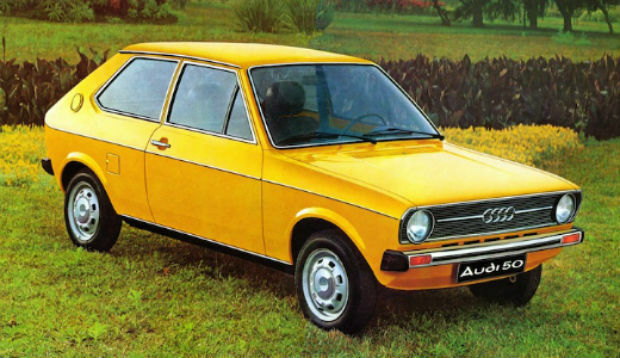 Throwback Thursday — 1976 AUDI 50 by Jim Corbran, Automotive Columnist If you think this little yellow car looks familiar, you must be up on your European car-spotting. The Audi 50, built from 1974-78, was eventually rebadged as the Volkswagen Polo, a car in the supermini class so popular in Europe for a variety of reasons (cost, size, fuel economy...). Although the Audi 50 disappeared after only five years, VW still produces a Polo — it even comes in a spiffy GTI version (which you can see here: http://www.volkswagen.com.my/en/models/polo-gti/gallery.html). ### Jim Corbran, Automotive columnist for Artvoice Read You Auto Know every other week in Artvoice, and check the YAK blog daily here: http://blogs.artvoice.com/avdaily/category/you-auto-know/ The post Throwback Thursday — 1976 AUDI 50 appeared first on Buffalo Cars.